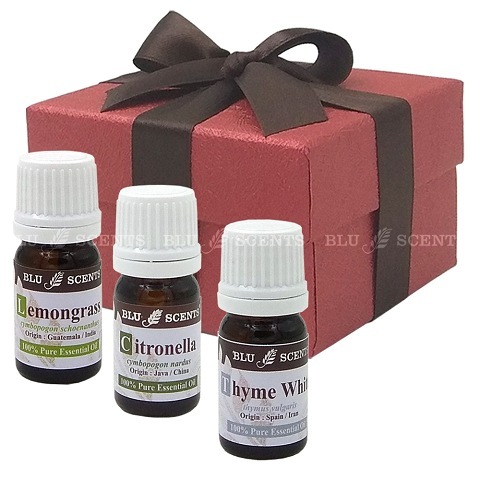 Delight your senses with wonderful aromas and make your home smells great by simply diffusing Blu Scents therapeutic grade pure essential oils. Greenish forest-like aroma of Pine Needle blended with breezy minty-herbaceous scent of Rosemary are great for enlivening & lifting the spirit. 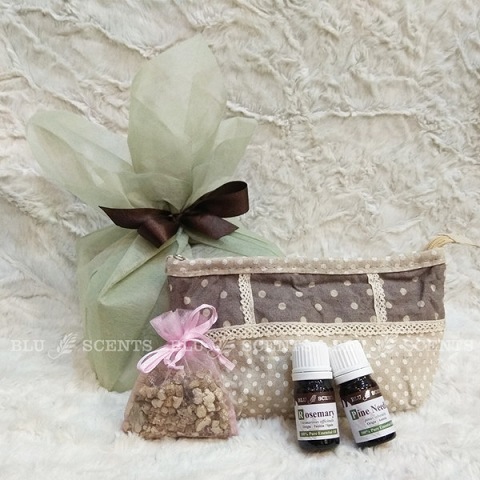 This gift set also comes with a lovely flowery sachet & a canvas lace pouch keeping your accessories neat & organized. Nicely presented with ribbons & decorated with ribbon, great for self-indulgence or gift givings. The design or colour of wrapping paper and ribbon may vary depending on availability. * Positive, strengthening effect on mind & body. * Very strong airborne germ-killer. * Alleviate asthma, sinusitis, colds & coughs. * Helps with poor circulation & skin problems. * Relieves muscular stiffness & soreness. Blends well with Tea Tree, Cypress, Frankincense, etc. Perfectly safe for home use. Avoid if allergic skin conditions. * Aid memory, relieve mental fatigue & lethargy. * Good for poor circulation, breathing problems. * Help to relieve headaches & migraines. * Effective in treating dandruff & hair loss. * Relieves muscular soreness, arthritis, gout. Blends well with Lemongrass, Ginger, Eucalyptus, etc. Perfectly safe for home use. Do not use of epileptic, high blood pressure /pregnancy. Inhaled it for coughs, bronchitis & other breathing problem. This adorable canvas lace pouch is the perfect accessory to hold everything from notes & coins to tiny treasures. The design and colour of this lace pouch will be packed randomly unless specify when order is placed and subject upon availability. The flowery scented granular or dried flower fillers must be a perfect additional accessory item for your home fragrancing collection. It can be placed in your drawers, wardrobes, cars, offices, bathrooms and etc! Nicely packed in a lovely sheer organza bags with drawstring, make it easy for hanging. The fillers or color of the sheer organza bags might be vary and depending on the availability.